Police are seeking the public's help in identifying and locating two suspects who robbed a jewelry store in San Jose last year. On Dec. 20, at 7:44 p.m., to suspects committed a strong-armed robbery at Ben Bridge Jeweler at the Westfield Valley Fair Mall located at 2855 Stevens Creek Blvd. According to police, a male suspect entered the store and asked to see merchandise. As an employee showed him a diamond, the suspect immediately reached over the counter and grabbed it. The two struggled over the merchandise, but the suspect was eventually able to take control of the diamond and flee the store. The suspect was accompanied by a female suspect who followed him out of the store, police said. The suspect is described as a black man, about 25 years old, 6 feet 1 inch tall, wearing a button-down long-sleeve blue collared shirt, dark pants and white tennis shoes. 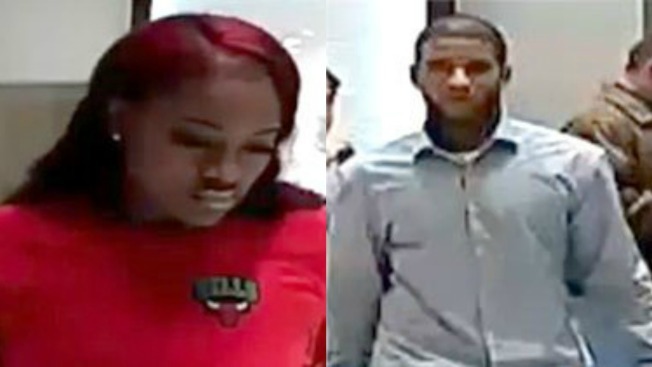 The second suspect is described as a black woman, 18 to 22 years old, wearing a red shirt with "Bulls" written on it and the Chicago Bulls emblem on the front left side. She was also wearing dark pants with "Bulls" written on the waistband and white tennis shoes, police said. Anyone with information about this incident is asked to contact San Jose police Det. Villanueva at (408) 277-4166. Individuals who wish to remain anonymous can call the Crime Stoppers Tip Line at (408) 947-7867. Anyone providing information leading to the arrest and conviction of the suspects may be eligible for a cash reward from the Silicon Valley Crime Stoppers.